Here is one of our all-time no-added-sugar favorite breakfast cakes. Over the time, I experimented a bit with the ingredients, especially the dried fruit. I found raisins and dried apricots not as yummy as dried figs and dates. And I prefer walnuts over Cashew kernels. But in general, any sweet dried fruit and any nut or mixture of nuts will do. 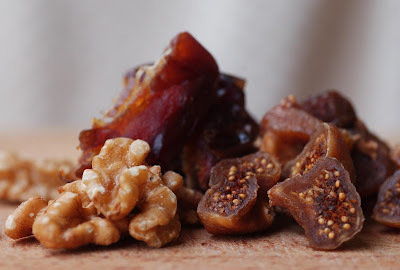 Cut the figs and dates into small chunks. Mix them with the cinnamon in a bowl and let them soak in the fruit juice for about 15-20 minutes. 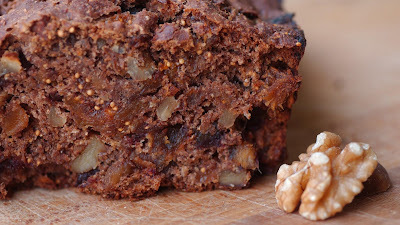 Cut the walnuts into chunks and combine them with flour and baking powder and add to the dried fruit mixture. Add the milk and stir thoroughly, making sure that the dried fruit don't stick together in big chunks. Fill in a buttered form and bake at 180 degrees for about 1 hour in the lower third of the oven.